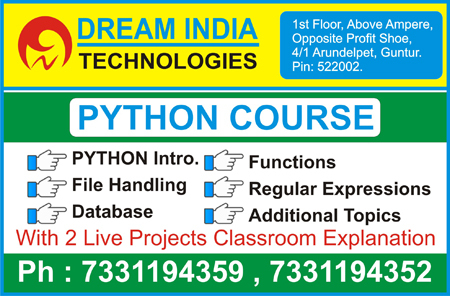 Dream India Technologies is the Best Software Training Institute For Ms Office, Tally, C, JAVA, Dot Net, Python, PHP, Oracle, Android, AutoCAD, Staad Pro in Guntur. 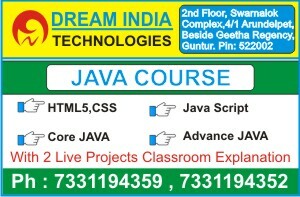 Dream India Technologies is the best Software Training Institute in Guntur. We offer specialized skill-based practical training on Ms Office, Tally, Web Designing, Graphic Designing, C, C++, PHP, Dot Net, Java, Python, Android, Oracle, Autocad, Solidworks, Ansys, Creo, Catia, Unigraphics, NX CAD, NX CAM, Staad Pro, Etabs, Mx Road, Revit, 3Ds Max, Primavera, Ms Project, SEO and Digital Marketing. Our goal is to deliver Practical Oriented Quality Computer Education to students with real-time projects. Our course curriculum's are designed for students, working professionals and entrepreneurs to learn and implement concepts in real world scenarios. Our goal is to deliver Practical Oriented Quality Training to Students of Guntur with latest Trends. Attend our Free Demo and Experience the Quality of our Training! Call Us 7331194359. 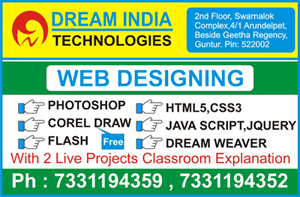 Moreover Dream India Technologies is best Software Training Institute For Web Designing Course in Guntur. In Web Designing Course we will train Photoshop, Flash, HTML5, CSS3, Java Script, JQUERY and Dream Viewer. 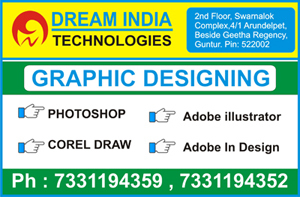 As Matter of Fact Dream India Technologies is best Software Training Institute For Graphic Designing Course in Guntur. In Graphic Designing Course we will train Photoshop, Corel Draw, Illustrator and In-design. In Photoshop course we will train how to edit images, how to create background arts, Logos and Banners. C language is one of the most widely used programming language of all time. C was developed by Dennis Ritchie between 1969 and 1973 in Bell Labs and used to re-implement the UNIX operating system. In 1989 C has been standardized by the American National Standards Institute (ANSI). C language is standardized programming language with international standards. 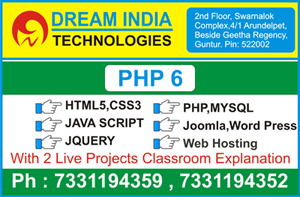 Moreover Dream India Technologies is best Software Training Institute For PHP Training in Guntur. PHP is a Server side Scripting language mainly used for developing server side web applications. PHP means “PHP: Hypertext Preprocessor”. 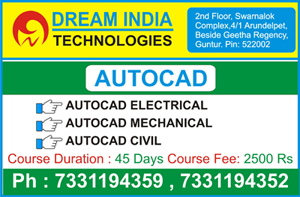 Moreover Dream India Technologies is best Software Training Institute For AutoCAD Training in Guntur. AutoCAD is computer-aided drafting software application used to create blueprints for buildings, bridges and computer chips. After learning AutoCAD Course students can create 2D, 3D drawings. We can use these drawings in architecture, Construction and Manufacturing. 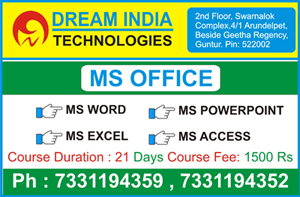 Dream India Technologies is the best Computer Training Institute in Guntur For ms Office. We Offers Job oriented & Placement Focused Ms Office training in Guntur. In Ms Office course we will train Word, Excel, Power Point and advanced excel. Microsoft word often called as word, mainly used to type and save documents. Ms Word mainly used to create Resumes, News Articles, Blog Posts, business letters and Legal Documents. Dream India Technologies is the best Accounting Institute in Guntur For LearningTally Course.Dream India Technologies is an Authorized Tally Training Institute in Guntur. Tally is an Accounting Software. 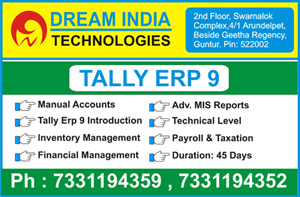 Dream India Technologies Guntur is the best Accounting Institute for Tally Erp 9, Tally Server 9, Tally Developer 9 and Tally Shopper 9 Training Institute in Guntur. In the present scenario, Tally is trusted by many reputed companies to store and transfer their financial statements. We are giving Tally Training on Latest Purchased version. 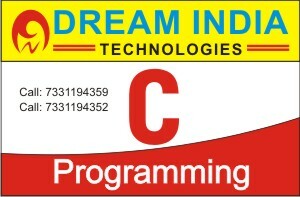 Dream India Technologies offers Job Oriented and placement Focused tally Training in Guntur with Latest Treands. Dream India Technologies Offers Job Oriented and Placement Focused Oracle course in Guntur. In Oracle Course we will train SQL and PL/SQL. SQL and PL/SQL both are completely different languages .SQL is a limited language that allows you to directly interact with the database. We can manipulate objects (DDL) and data (DML) with SQL, but SQL doesn't include all the things that normal programming languages have such as loops and conditional statements. PL/SQL Supports Loops, Conditional Statements. 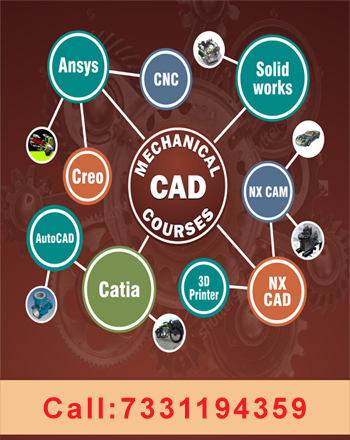 Dream India Technologies Offers Job Oriented and placement focused Mechanical CAD Courses Training in Guntur. We are offering training’s on all Mechanical CAD Courses. 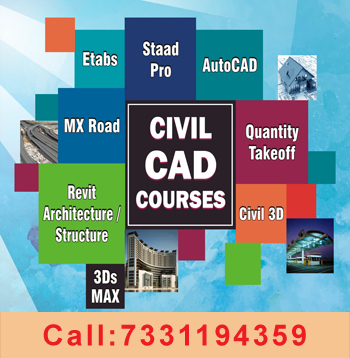 Civil CAD Courses in Guntur - Best Civil CAD Training Institutes in Guntur @ Dream India Technologies. Click below links for CIVIL CAD Course Content and Course Duration. We Offers 2018 – 2019 IEEE Projects for final Year Students in Guntur. We offer IEEE Projects for CSE, IT, MCA, ECE, EEE, CIVIL and Mechanical Branches. CSE, IT, MCA IEEE Projects for 2018 - 2019 final year students in Guntur. We offers 2018 – 2019 IEEE Projects for CSE, IT and MCA Students in Guntur. We are sharing Abstracts, Base paper, UML Diagrams, paper publishing and Source Code with Students. We are Providing Power Point Presentations for each Review. For CSE, IT, MCA students We Provide IEEE Projects on these technologies - JAVA, Dot NET, Python, Python Mechine Learning, Android, Hadoop BiG Data, Machine Learning, PHP and IOT. ECE, EEE IEEE Projects for 2018 - 2019 final year students in Guntur. We offers 2018 – 2019 IEEE Projects for ECE, EEE Students in Guntur. We are sharing Abstracts, Base paper and Paper Publication with students. We are Providing Power Point Presentations for each Review. For ECE students, We are Providing IEEE Projects on these technologies - Embedded With Image Processing, IOT, VLSI, DSP and ROBOTICS. For EEE students, We are Providing IEEE Projects on these technologies - Matlab, Power Electronics and Plc Scada. Mechanical, Civil Projects for 2018 - 2019 final year students in Guntur. We offers 2018 – 2019 IEEE Projects for Mechanical, Civil Students in Guntur. We are sharing Abstracts, Base paper and Paper Publication with students. We are Providing Power Point Presentations for each Review.